With the NFL season in full swing, I thought I would share a graphic that impressed me. It shows how Data Visualization and the power of Data Science can help us understand more about our lives and things we enjoy. It was developed by Sean Taylor of the Facebook Data Science Team, and credits go to him and his team for this creative work, which leveraged data from over 35 million Facebook account holders . 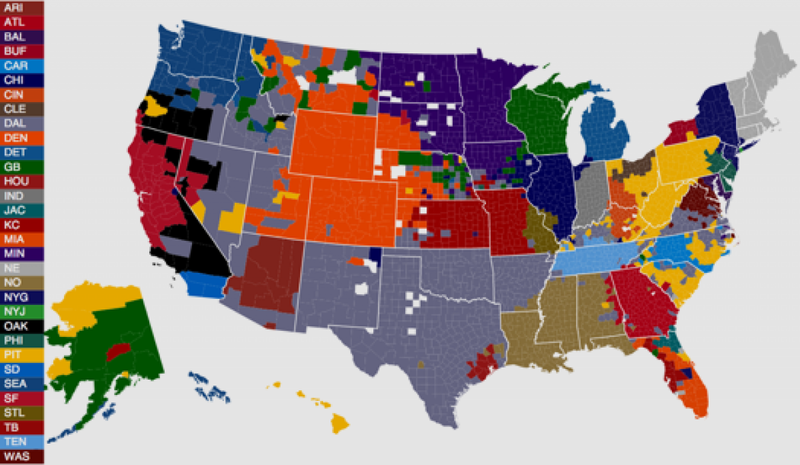 It shows the NFL team with the largest following in each county in the US. Data comes from Facebook likes. It also shows us a great example of how Data Science and Big Data can be used to answer questions about business in powerful ways. At first pass, I am intrigued to see in which counties specific teams have a dominant or major fan following. Hailing from Tampa, Florida, I am somewhat disappointed to see that the Buccaneers show a small footprint only on the west coast of Florida. But the Dolphins dominated before the Bucs arrived and northerners brought their team favorites when moving south, so the truth is building a fan base takes some time. And, building a new sports fan based in Florida is especially hard. Other interesting truths about our favorite NFL teams show through. Now, living in northern IL, I can attest that Packerland is nearby and sharply defined by the state border with Wisconsin. My family and I vacationed in upper Michigan this summer. It is a beautiful place (I recommend it for a great get away). The people in the upper peninsula call themselves Yoopers and they root for the Detroit Tigers in baseball and Green Bay Packers in football – strange to see a split on geographic preference. South Carolina follows another drumbeat altogether – too dignified to root for Carolina -which is in North Carolina and yet humble enough to chose a northern team instead. Who would have thought? The data tells us other things that are of great value in business too. Not all NFL teams are of the same value – owing to their fan base. Indeed, the Dallas Cowboys are America’s team (or at least the the team of the west and parts of the mid-Atlantic). Younger teams or transplanted teams like Jacksonville, Houston, Saint Louis, and even Arizona have yet to solidify a broad geographic base. Such factors would be important in understanding who is a fan, who might be a fan, and what is the sphere of influence of an NFL team. Maybe the Oakland Raiders are best positioned in the Los Angeles area, after all. This great work done by the Data Science team at Facebook shows how data in social networks can be “inverted” to answer questions about a market or business. This is a powerful concept. People vote for their favorite team. Facebook records that information and location and inverts it to provide a view on the sphere of influence of a given team. In some small way, this also says something about the value of the franchise – which leads us to the concept of asset surveillance. It is possible because of the Big Data effect. These transformations of the data can bring value from this Big Data. Advertisers, franchise owners, TV networks, and even athletes might look to such data to understand the value of a fan base and the business possibilities that the fan base can create. He has advised many leading institutions on monetizing data and getting more from their data science investments, including leading sports teams. He is a Tampa Bay Buccaneer fan – even when they lose and prefers the Bears over the Packers, but wishes the Bears had Aaron Rodgers.